During Nov. 2017, National Cultural Audiovisual Archive (NCAA) has received the global certification as Trustworthy Digital Repository as per ISO 16363. It is India’s and world’s first certified Trustworthy Digital Repository. This certification has been awarded by Primary Trustworthy Repository Authorization Body (PTAB), UK. ISO 16363 is an umbrella standard requiring technical conformance with several ancillary standards such as Open Archival Information System (OAIS) ISO 14721, OWASP ISO 27034 Application Security, Information and Security Management ISO 27001, and several other standards dealing with metadata, file formats and open technologies. The digital repository is audited on basis numerous technological parameters to ensure long term preservation of digital data. C-DAC Pune in collaboration with IGNCA, New Delhi had taken up NCAA as a pilot digital repository to be developed as part of Centre of Excellence for Digital Preservation, Sponsored by MeitY. This digital repository is established with and powered by DIGITĀLAYA (डिजटालय) an archival management system developed by C-DAC Pune, which complies with Open Archival Information System (OAIS) ISO 14721. 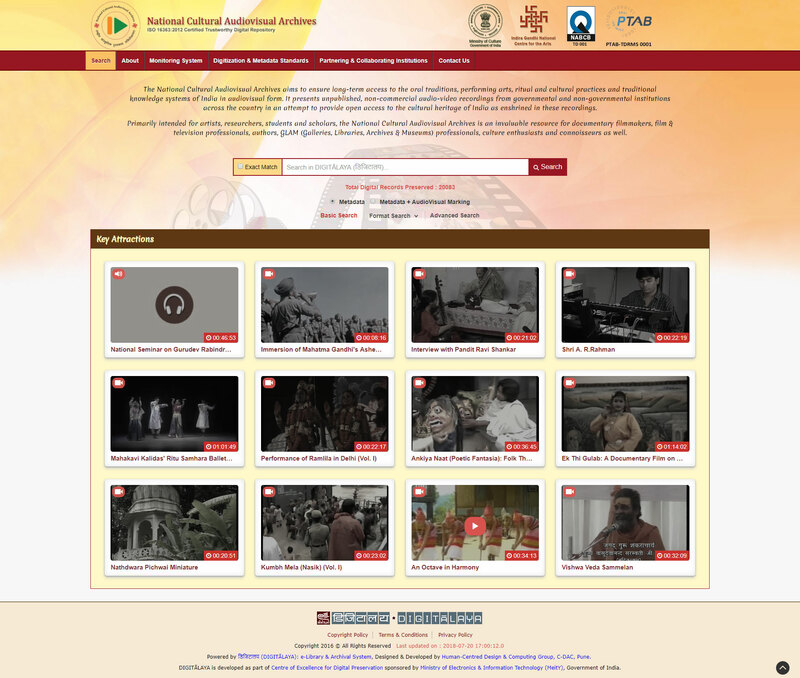 It is being used by the users from 21 partnering institutions who contribute audiovisual data in this digital repository regularly. Presently, NCAA is managing around 2 Petabytes of rare cultural audiovisual data pertaining to dance, drama, music and literature. NCAA happens to be the first Certified Trusted Digital Repository (Certificate No. PTAB-TDRMS 0001) as per ISO 16363 in India and world. United States Government Publishing Office (US GPO) happens to be world’s 2nd in getting such certification as per ISO 16363.